We honor those brave Americans and Allies who gave the ultimate sacrifice for our country on Memorial Day in conflict all over the world from World Wars to small conflicts. Memorial Day is a day for remembering and honoring military personnel who died in the service of their country, particularly those who died in battle or as a result of wounds sustained in battle. While those who died are also remembered on Veterans Day, Veterans Day is the day set aside to thank and honor ALL those who served honorably in the military - in wartime or peacetime. Three years after the Civil War ended, on May 5, 1868, the head of an organization of Union veterans — the Grand Army of the Republic (GAR) — established Decoration Day as a time for the nation to decorate the graves of the war dead with flowers. Maj. Gen. John A. Logan declared that Decoration Day should be observed on May 30. It is believed that date was chosen because flowers would be in bloom all over the country. The first large observance was held that year at Arlington National Cemetery. The ceremonies centered around the mourning-draped veranda of the Arlington mansion, once the home of Gen. Robert E. Lee. Various Washington officials, including Gen. and Mrs. Ulysses S. Grant, presided over the ceremonies. After speeches, children from the Soldiers’ and Sailors’ Orphan Home and members of the GAR made their way through the cemetery, strewing flowers on both Union and Confederate graves, reciting prayers and singing hymns. Honoring the brave sacrifices of both sides of the war with this national holiday was a way for our nation to heal after the long years of the Civil War. It is safe to say that the Memorial Day foundation grew within the communities and States and evolved into a federal holiday. It was not until after World War I, however, that the day was expanded to honor those who have died in all American wars. In 1971, Memorial Day was declared a national holiday by an act of Congress. It was then also placed on the last Monday in May, as were some other federal holidays. The crowd attending the first Memorial Day ceremony at Arlington National Cemetery was approximately the same size as those that attend today's observance, about 5,000 people. Then, as now, small American flags were placed on each grave, a tradition followed at many national cemeteries today. In recent years, the custom has grown in many families to decorate the graves of all departed loved ones. To ensure the sacrifices of America's fallen heroes are never forgotten, in December 2000, the U.S. Congress passed and the president signed into law, The National Moment of Remembrance Act, creating the White House Commission on the National Moment of Remembrance. 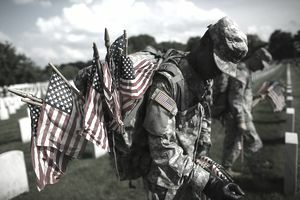 The commission's charter is to encourage the people of the United States to give something back to their country, which provides them so much freedom and opportunity, by encouraging and coordinating commemorations in the United States of Memorial Day and the National Moment of Remembrance. The National Moment of Remembrance encourages all Americans to pause wherever they are at 3 p.m. local time on Memorial Day for a minute of silence to remember and honor those who have died in service to the nation. As Moment of Remembrance founder Carmella LaSpada states: "It's a way we can all help put the memorial back in Memorial Day."